A spokesperson for FCNN told the ASSIST News Service (ANS), "This action [of burning the Bibles], which has been confirmed by informed sources, was aired on a site belonging to the Pasdaran paramilitary organization, is nothing less than shameful and the persons responsible must be identified and exposed to the whole world." The report said that on Saturday, May 29, 2010, Ati News, a site belonging to Morteza Talaee, the previous head of the security forces and the current member of the Tehran's city council, "in its usual anti-Christian propaganda" reported that their social-life reporter had disclosed that shipments of so called, "Perverted Torah and Gospels" had entered Iran through its Western borders. Two days later, on Monday, May 31, 2010, the same report was reiterated by the official anti-crime website of the Pasdaran Army called "Gerdaub" which said that a large shipment of Jewish and Christian Scriptures had entered Iran through the Western Azerbaijan province and, according to security officials of that province, the "occupier forces" that operate in the Western regions of Iraq were responsible for such activities. FCCN stated that Gerdaub, the official website of the Pasdaran Army [also known as the Iranian Revolutionary Guard Corps (IRCG] continued its report by quoting the security official who had stated: "Some of these books are distributed locally, but most of the books are smuggled and distributed all over the country. 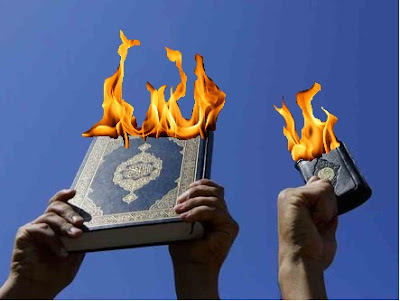 In just the last few months, hundreds of such 'perverted Bibles' have been seized and burned in the border town of Sardasht." The same unidentified security source added that his intention has been to "inform and enlighten" people. "While the depiction of the Prophet of Islam and other historical religious leaders, whether in good or bad taste, has caused uproar and violent protests, threats of retaliation and assassinations, closure of embassies, long and mournful marches in various parts of countries of the world such as Pakistan, Iran, and Saudi Arabia, its quite interesting that the official website of the most powerful military wing of the Islamic Republic of Iran engages in the shameful act of reporting the burning of Bibles," said the FCNN spokesperson. "Of course, the security officials have not clarified the difference between these so called 'perverted Bibles' and those that are commonly used by people around the world - including Iran. "These officials shamefully label the Holy Scriptures of the Christians 'contraband' without realizing the over two billion people around the world and at least five hundred thousand people in Iran revere and consider holy. This action is no different than what the government has wrongfully accused many Christians of insulting the sacred beliefs of Islam. "On the hand the defenders of the Islamic Republic of Iran in the international organizations and human rights forums claim that religious minorities such as Jews and Christians enjoy constitutional protection and the adherents of these religions not only can elect their own representatives to the parliament, but exercise their religious rights freely and openly. "But, as with many other rights and freedoms granted to the people in the constitution, this fundamental right has also been violated and repressed by the Islamic government." The spokesperson went on to say, “The leaders of the Islamic Republic not only use the weapon of their pre-selected parliamentary candidates to control who gets into the legislature, but severely suppresses the religious minorities by demanding the names of those attending church services, banning the entry of Farsi-speaking members into church building and any preaching in the Farsi language, rejecting any building permits for church buildings, and the publishing of Bibles and other Christian literature which amounts to nothing but direct interference in the religious affairs of the very people it claims to be protecting. 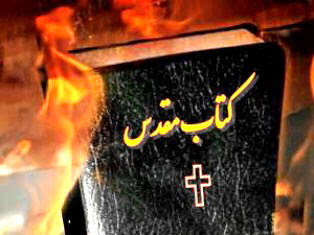 Such insults and offensive actions in burning the Christian Bible coincides with the Islamic community's full enjoyment, freedom, and the blessings of the Western nations that allow them to publish the Islamic Holy Book, the Quran, and to build as many mosques as its needed in various European and North America cities. If the Quranic claim that the word of God can never be perverted and changed, then there must be a copy of the real Torah and the Gospels somewhere. To this question Muslims have not credible answers. There is no such difference or variance between today's Scriptures and the original writings. Our modern Bibles go back to the very ancient copies of the scriptures that in some cases date back to only 50 years from Christ Himself. There are even copies of the Old Testament that date several hundred years before Christ. The spokesperson concluded by saying, “In any event, the burning of any book, especially one that is honored and revered by a great majority of people around the world, is an unacceptable and immoral act and must be condemned by the world community.